We care because we want Nova Scotia to be a healthy, resilient place where we can thrive and flourish, find our potential, and live in communities free from gambling harms. While gambling is legal, it is not harmless. 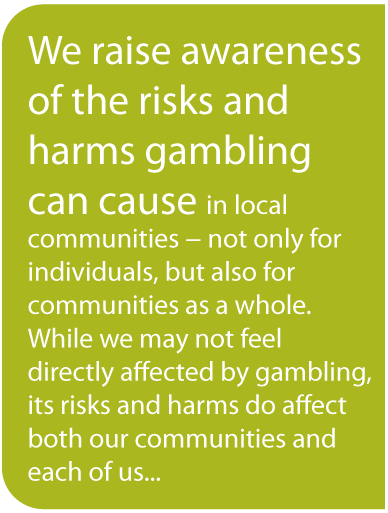 We all know many stories of the harms that individuals who gamble and their families can experience because of legalized gambling; but gambling harms can also affect the community as a whole. There is a ripple effect: Gambling can lead to increases in bankruptcies, domestic violence, embezzlement, and yes, even suicide. Financial costs we and our communities pay for include increased needs for mental health, addictions and social services. The costs are also personal with tragedy, loss and decreased community trust and loss sometimes the result. Gambling harms are felt by all of us as citizens, and especially by those of us who are particularly vulnerable such as youth and seniors. To learn more, visit the What We Know section of our website.